Day Two from London. Another interesting difference between our two public education systems is that many of the schools in England require students to wear uniforms. At the secondary level, this is usually khakis and a polo shirt. 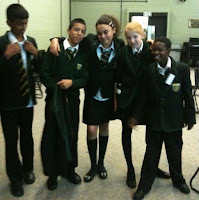 Some schools go a little further and require blazers and dressier pants. Since many of the schools here are organized by “houses," each house might have a particular article of clothing in common. For example, if all students are required to wear ties (boys and girls), each house might have a different tie. In more casual schools, each house might have a different color polo shirt, but all with the same school emblem. I know the uniform issue gets debated a lot in the US, with pros and cons on both sides. What I notice here is that it does create a sense of pride and Belonging. The outward and obvious association with the school and within the school, a house, helps students feel like they are part of something bigger than themselves. There really isn’t that “But they can’t express their individuality” that some wring their hands over. The students' individuality is evident in who they are and how they act. Nor does wearing a uniform remove the adolescent need to push back in the way they dress. I have been tying and wearing a tie myself since I was 13, but have rarely seen such an amazing variety of knots and tie lengths--all designed to stay within the dress code while testing its boundaries. Shoes, socks, jewelry, rolled sleeves, shirts tucked in or out, all come creatively into play in eternal struggle between adults and young people to follow the rules.